After his visit to Nindooinbah after Rocky Beef Week in May – his second consecutive Beef Week, Paraguayan-based consultant Federico Maisonnave wrote to Nindooinbah manager Nick Cameron about his second visit to the herd in 3 years. “It’s been 3 years since I came for the first time to Nindooinbah. I was recommended to contact Nick and Don (Nicol) by an AI company rep and got interested immediately in their Ultrablack program. I am familiar with Ultrablacks having seen the birth of the breed in USA some years ago in the herd of my now client, Cow Creek Ranch. We exchanged some information about Brangus and Ultrablacks and we discussed future plans… I was impressed with the results so far and the business plan they had already on the ground and were developing. 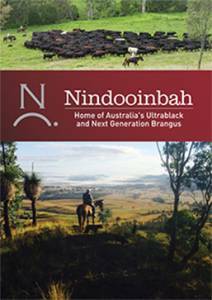 I came back to Nindooinbah 3 years later in May 2015 after Beef in Rockhampton with the goal of spending more time there and if I could be lucky enough to be able to see what those genetics could do for their commercial customers…That is the real world…! I have learned in my role as a breeding consulatant that exposing genetics from one environment to the other and watching them perform is how you measure the success of your program as a seedstock breeder…. 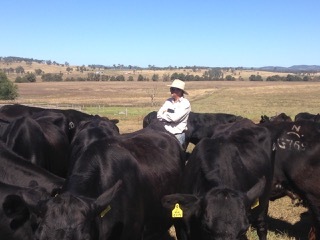 I was pleased to be able to spend time in the week with Nick, Don again, Euan (Murdoch) and the crew (great people) not only checking their entire breeding program inside the farm gate, but got the chance to visit the growing Ultrablack herd of their client Melrose Station. As a consultant who works in USA and South America I am exposed constantly to breeding programs of many sizes, different regions of the world and breeds… It’s been a long time since I’ve been so surprised to see such genetic progress and results in such a short time… Well… in this case I was astonished…! Not only at Nindooinbah, but at their customer’s… I know that there are more Nindooinbah clients with success out there, but it has been is a long time since I saw anything like what is happening at Melrose Station. What I saw at Nindooinbah and their customers, you don’t see very often… Despite the young age of the breeding program, they have put a unique and efficient genetic selection program in place… Nindooinbah made a 25 years normal progress in 3 years through the use of ET with selection of the best genetics available and they are prepared to ramp that up for the future too. They have the right kind of genetics and strength of the breeding program that would work on almost any environment on several continents. Federico Maisonnave, Asuncion, Paraguay June 2015.